Epic announced the news in a blog post today, saying that designer Cliff Bleszinski has left to "chart the next stage of his career." 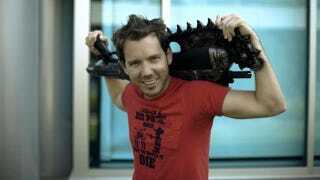 Bleszinski, who worked at Epic for 20 years, was often the face of the company and the creative vision behind Gears of War, Jazz Jackrabbit, and many of Epic's other games. He's well known for his outspoken views, openness with fans, and significant contributions to both the Unreal game franchise and the ubiquitous Unreal Engine. "In 20 wonderful years with Epic, Cliff Bleszinski has grown into a true design luminary, and his contributions to the ‘Unreal' and ‘Gears' series have helped shape the game industry into what it is today," wrote Epic founder and CEO Tim Sweeney. "Cliff leaves Epic with our gratitude for his many contributions, and our wishes for continued success in the next chapter of his life!" I will miss the projects, the playtests, the debates, and most importantly, the people. Epic only hires the best of the best, and it has been a joy working with each and every one of you on a daily basis, whether you were hired weeks ago or decades ago. I have been fortunate enough to collaborate with a variety of disciplines, from code to art to marketing and PR – it's been one big, rewarding learning experience. I'm confident that each project that is being built, whether at Epic, Chair, PCF, or Impossible will be top notch and will please gamers and critics alike. The next Gears of War game, Gears of War: Judgment, is scheduled for release this March.